Last year, my office handled 4,500 court appearances for kids accused of committing crimes in San Francisco. Most of our young clients landed in the juvenile-justice system after being funneled out of The City’s public schools — educational journeys long on punishment but short on help. As public defenders, we try to disentangle them from their legal troubles, to pluck them from the school-to-prison pipeline even after they’ve gathered momentum. Ours is the only public defender’s office in California with a unit dedicated solely to educational advocacy. But the pipeline itself needs to be dismantled. Now, San Francisco is poised to take a big step toward keeping its youths in the classroom instead of the courtroom. On Tuesday, the Board of Education will vote on a resolution to end the counterproductive practice of suspending the kids who most need educational help. Commissioner Matt Haney’s Safe and Supportive Schools resolution would end suspensions for “willful defiance,” an ambiguous offense that accounts for 40 percent of all suspensions and 80 percent of suspensions of black and Latino students. It would create a districtwide guide and reporting system for behavioral interventions, and create a strategy to fix the disproportionate number of students of color who are punished. If the resolution passes, the superintendent will have four months to implement the changes. Kids who don’t finish high school are nearly four times more likely than graduates to be arrested, and more than eight times as likely to be in jail or prison. High school dropouts cost California more than $1 billion annually in juvenile crime costs. The link between suspension and crime has been proven. 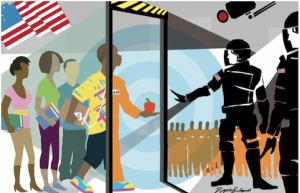 A recent study by the Council of State Governments found that students who had been suspended or expelled were nearly three times more likely to have contact with the juvenile justice system in the following year than similar students who had not been pulled from the classroom. The racial disparity in school punishment mirrors the racial disparity we see in juvenile court. Something is wrong when black and Latino youths, who make up only 35 percent of San Francisco Unified School District students, account for more than three-fourths of its suspensions. Haney’s resolution would finally make implementing evidence-based, restorative practices a priority. It would provide guidance and clarity to teachers and administrators. And most importantly, it will keep kids in the classroom and not the courtroom.